Making a cookie box is one of those things that really tests your commitment levels. 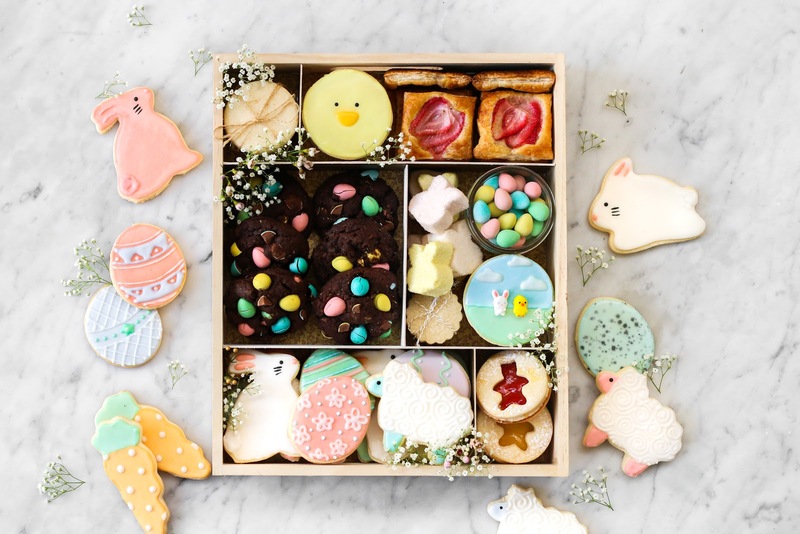 I originally struggled with committing to making an Easter cookie box this year because it is a project that takes many hours of both active labour and many hours of patience while waiting for icing to set and dry. 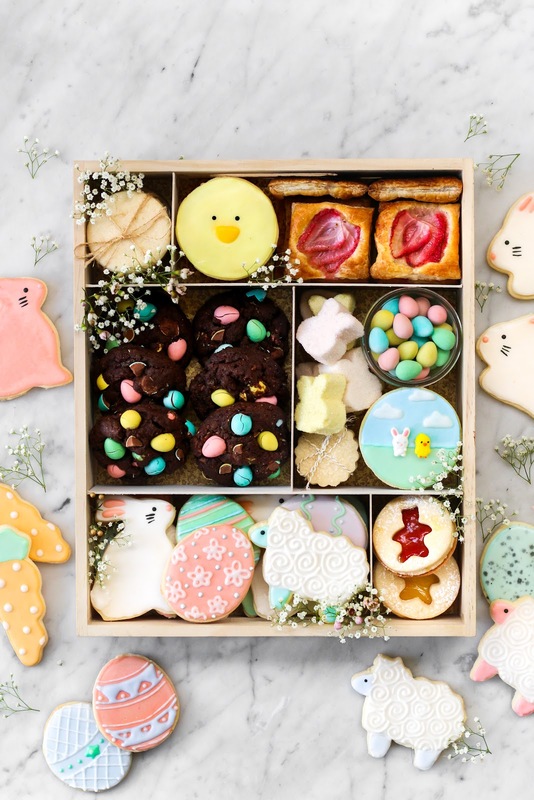 Nonetheless, I really wanted to leave you with all with some Easter cookie box inspiration for this upcoming holiday. I am sharing my favourite sugar cookie recipe as well as a recipe for fudgey almost-brownie-like cookies studded with mini eggs and chocolate chunks. 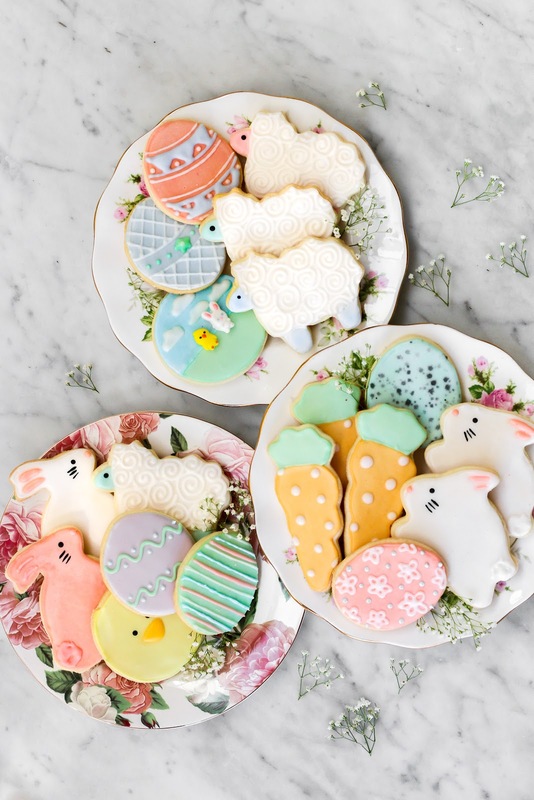 I have always had a soft spot for intricately decorated sugar cookies. It really is one of those treats that show that you can make something so spectacular out of a simple recipe. A classic sugar cookie dough only calls for ingredients that you probably already have in your pantry. I never fail to enjoy a classic sugar cookie, even if it from a grocery store. It is the mixture of the sugar, butter, and nostalgia that gets me every time. I decorated my first sugar cookie about two years ago. I was at my aunt's house for the winter holidays and she had all the tools (and all the piping tips) needed to decorate sugar cookies with any design one can possibly dream of. We started baking the cookies early in the morning and did not finish decorating all big batch until after dinner. It was a whole day affair. You have to bake the cookies, let them cool, make icing of different consistencies, and wait for the icing to dry before you have a finished cookie. It took many, many hours but I had so much fun the entire time. My aunt generously shared her recipe with me and it is now my go-to recipe for a classic sugar cookie. I might or might not have increased the amount of butter the recipe calls for to make the cookie even richer (I did not think it was possible). This melt-in-your-mouth sugar cookie is vanilla-y, extremely buttery, and very delicate. 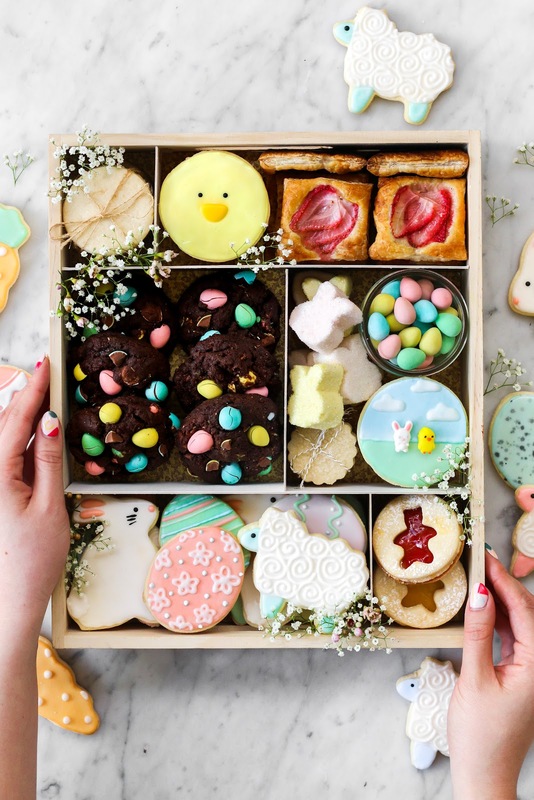 An Easter cookie box is much like a Christmas cookie box. You can fill it with whatever types of treats you like but the key is to have a good variety. I always like to have the classics in there — sugar cookies or shortbread, but decorated to fit the seasonal occasion. I traded in the peppermint sugar cookies for pastel-hued iced ones and icing sugar dusted crinkles for mini egg studded cookies. Then I like to incorporate a more seasonal cookie. It was ginger molasses cookies for my Christmas cookie box and this time it is a mini strawberry danish for Easter. A sweet treat (that I do not have to make) is always a good filler... like a small jar these mini eggs! Last time it was marshmallows. And there you have it. 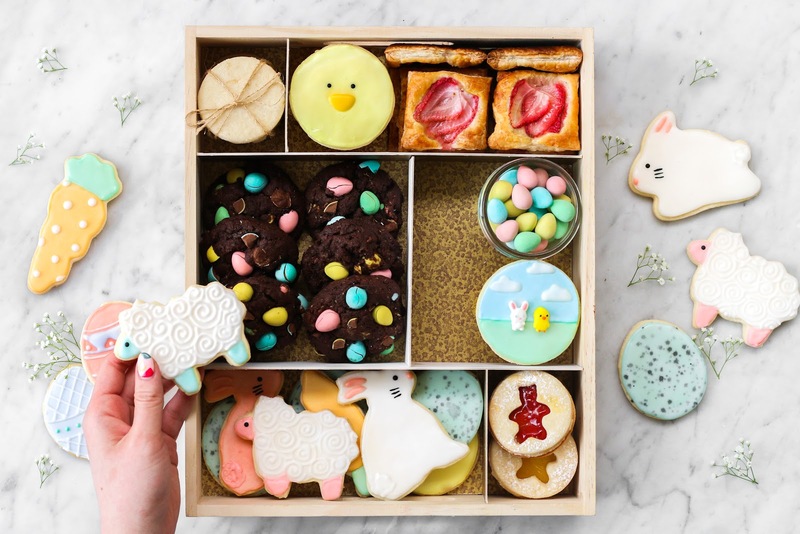 An Easter cookie box that you can make any time for Spring...or any season because no one will ever say no to a box of treats. Beat in egg, one at a time. Add vanilla and beat until well-incoporated. Chill the cut outs in the fridge for at an hour to prevent the cookies from spreading when baking. Bake at 315F for 12-14 minutes, just until the edges are golden brown. Using a piping tip, pipe out desired design. Let the designs fully dry before stacking the cookies. In the bowl of a mixer, cream together butter and sugars until smooth. In a large bowl, whisk together flour, cocoa powder, espresso powder, baking soda, and salt. Add the dry ingredients into butter mixture and mix until just combined. Add the minis and dark chocolate and gently fold into dough. Dough will be sticky. Scoop out dough into dough balls with an ice cream scoop. Chill the dough balls for an hour before baking. Bake at 350F for 10 - 11 minutes. Let cookies rest on cookie sheet for 15 minutes before moving to cooling rack. Thank you for informative & really needed a post about Inspiration. Hi,did you have a lid for your box? How did you keep the contents sealed?